Payments are processed on the 15th of each month and will continue to process until the balance has been paid in full. 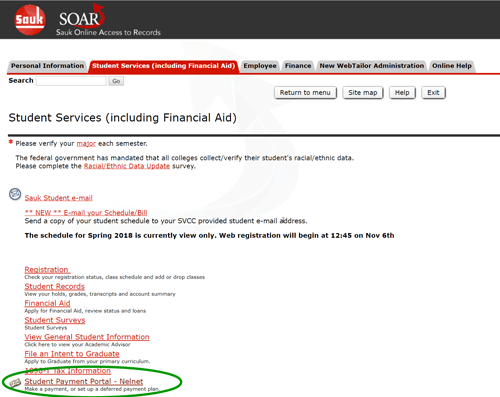 Follow the link above or click on the "Student Payment Portal - Nelnet" link in SOAR. Payment Arrangements are due for early registered students by December 3rd - Students may be dropped for non-payment. Please do not assume your balance will automatically be adjusted if financial aid is received or a class is dropped or added. Adding or dropping a class and other account activity will change the amount of the scheduled payment. You should review your agreement balance online or call Sauk Valley Community College Student Business Office at 815-835-6295 to confirm the change. Business Office at 815-835-6295 to confirm the change. Availability of the payment plan is determined by Sauk Valley Community College. Please be aware the college may elect not to have payment plan available during specific times and dates during registration.